Garth Illingworth's presentation at STScI on March 12, 2018. Galaxies at Cosmic Dawn: Exploring the First Billion Years with Hubble and Spitzer - JWST (Science Presentation). 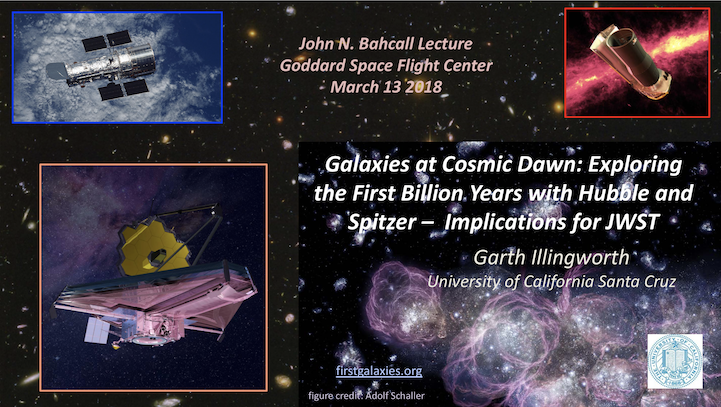 Garth Illingworth's presentation at GSFC on March 13, 2018. Galaxies at Cosmic Dawn: Exploring the First Billion Years with Hubble and Spitzer - JWST (Science Presentation). Garth Illingworth's presentation at NASM on March 14, 2018. The Earliest Galaxies: Exploring Cosmic Sunrise with Hubble, Spitzer, and JWST (Public Presentation). The John Bahcall Lectureship has been established by the Space Telescope Science Institute and the HST Project/Goddard to honor the late Professor John Bahcall for the seminal role he played over three decades in championing the Hubble Space Telescope. Together with Lyman Spitzer, John convinced NASA and the astronomical community that a large space telescope could not only provide unique capabilities to study the Universe, but that it would be a natural application for NASA's Space Shuttle program. He played a key role in developing the strategies and organizations for the effort that produced the Hubble Space Telescope (HST). During the lifetime of HST, John remained a staunch supporter of the project during the difficult time of spherical aberration that preceded the First Servicing Mission, and during subsequent budgetary problems within NASA that threatened to curtail the Hubble's scientific program and lifetime. He was a frequent visitor to Washington and the halls of Congress, testifying before Congress on the important manner in which the Hubble was changing our understanding of the Universe, and the significant impact it had in reaching every level of society, especially children, with a new view of the Universe and our role in it. Together with the fundamental research John did in diverse areas of astrophysics that resulted in John being awarded major international prizes such as the Fermi medal, the Dan David prize, and the National Medal of Science, his observing programs on the Hubble not only were an important part of his personal research; they also produced notable results. John was a principal investigator for one of the first Hubble Key Projects to study the evolution of absorption lines in quasars produced by intergalactic gas, which enabled his team to determine how the IGM evolves. He used Hubble's superb resolution to image distant quasars, and for the first time demonstrated the variety of characteristics of their host galaxies. John Bahcall was a leader, a mentor, and an ardent pursuer of new ideas. He listened as well as he advocated. STScI is pleased to honor John Bahcall by acknowledging his fundamental contributions to science, to Hubble Space Telescope, and to this Institute with this annual lectureship. The John Bahcall Lectureship is awarded each year to a leading astronomer based on the research excellence and accomplishments of the Lecturer, who spends one week at the Institute and delivers three lectures. Two of the lectures are research colloquia, and the third lecture is a popular public evening lecture that is widely advertised and attended at the National Air & Space Museum in Washington, DC. The honoree is selected by a committee, with Neta Bahcall being one of the committee members. Applications are not solicited. Archived John Bahcall Lecture Series webcasts are available for viewing at the STScI Webcast Archive. UCO/Lick Observatory • University of California Santa Cruz • This work is licensed under a Creative Commons Attribution 3.0 United States License.